Reality-based TV programs that feature cooking competitions, like Top Chef and MasterChef, have grown in popularity in recent years. These programs give participants the opportunity to share their talents with a wider audience and learn from more experienced chefs who judge their culinary skills. We watch these programs, cringing when a chef gets harsh feedback from the judges and celebrating when someone we like actually wins the competition. While not televised, S.Pellegrino – known for its sparkling natural mineral water – is currently holding its own cooking competition for young chefs. The goal: To foster and promote chefs early in their career. With 20 international regions, this competition seeks chefs between the ages of 18 to 30 years. To be considered, they must also have at least one year of experience working as a chef, sous chef or chef partie. 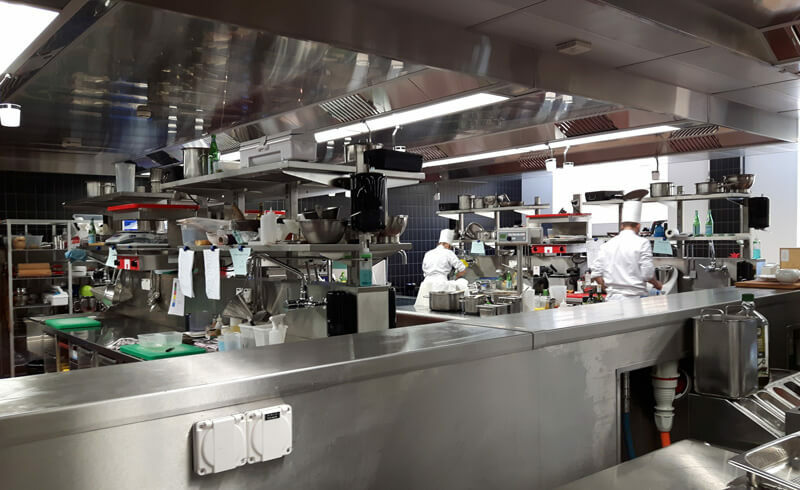 The ten semi-finalists for S.Pellegrino Young Chef 2016 in Switzerland gathered late last month at Zurich’s Belvoirpark Hotelfachschule to try and earn a spot in the finals this fall, and I had the chance to observe them in action. It had the flavor of a reality TV show, as these were real chefs competing to win in front of an audience, but thankfully, it lacked the over-the-top drama and background music to heighten the mood and anxiety. The contestants all seemed incredibly supportive of one another. And, when the judges provided feedback, everything seemed very civil and professional – this is Switzerland after all! I did not see any tears, and if there was any drama, it must have occurred in the kitchen (I did see one of the chefs scraping off a bricelet-style waffle that was completely stuck to the griddle...). How did these young chefs enter the competition? 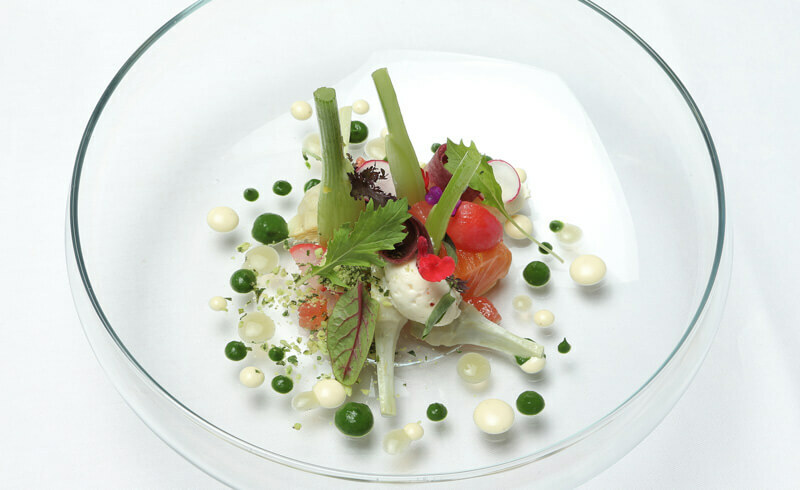 The S.Pellegrino Young Chef 2016 competition has a three-step application process. First, the chefs had to submit their application online via Fine Dining Lovers – an online magazine from S.Pellegrino & Acqua Panna. In addition to providing information about their professional experience, they had to submit a recipe and photograph of their signature dish. Among all 20 international regions, more than 3600 people applied to participate in this culinary competition in 2015. Next, ALMA – the International School of Italian Cooking, selected 10 finalists for each region. Finally, each region will hold live cooking competitions to determine a winner, and these 20 semi-finalists will compete at the grand final on October 13, 2016 in Milan. Throughout the competition, the contestants are evaluated based on five criteria: Ingredients, skills, genius, beauty and message. Who are these young chefs? The 10 semi-finalists for the Young Chef competition currently work at restaurants that represent the linguistic and cultural regions of Switzerland. All brought different cooking styles and experiences to the competition, which resulted in a diverse array of signature dishes. And what kinds of signature dishes did they prepare? In Zürich, the 10 finalists prepared their dishes on-site at the Hotelfachschule and presented them before a panel of four judges - André Jaeger, Martin Dalasass, Lorenzo Albrici and Robert Speth. In each of the regions for this competition, one of the judges serves as the mentor to the winning chef, providing guidance and helping to fine-tune their signature dish in preparation for the grand finale in Milan. 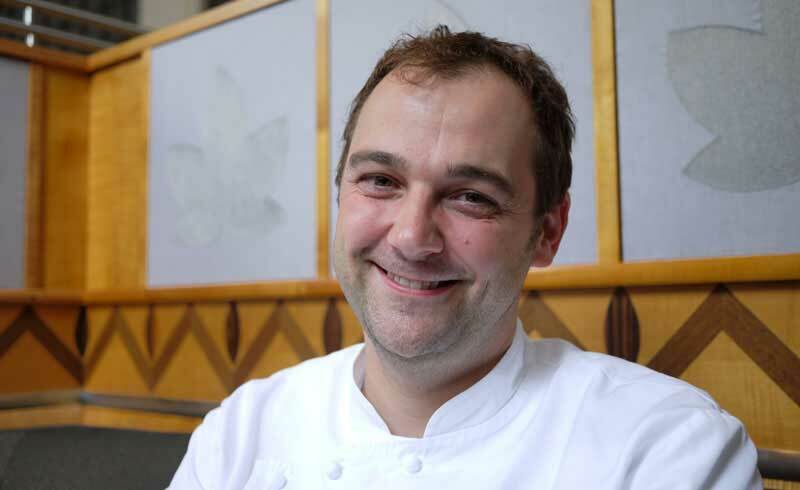 In Switzerland, André Jaeger, Chef at the Rheinhotel Fischerzunft in Switzerland and President of Les Grandes Tables de Suisse, has been selected as the mentor for this competition. The signature dishes presented before the judges were extremely inventive and featured exotic ingredients - like squid ink, kudzu starch and Cynar, a bitter Italian liquor made from herbs and artichokes – items that I do not typically stock in my home kitchen! I saw a diverse range of cooking influences, such as Japanese, French and Italian, as well as a reimagined Bernese platter - a typically Swiss dish from canton of Bern. One of the plates, prepared by second-place finisher Chef Mauricio Munoz, used local Swiss ingredients like Rheintaler Ribelmais and Sbrinz cheese. It also featured a small white bowl filled with dry ice and vegetable water, which caused a mysterious cloudy smoke to emit from the dish as it was being served. I enjoyed seeing each plate as it came out of the kitchen - all such amazing culinary creations, and as unique as the chefs who prepared them. The chefs had the opportunity to briefly discuss their dishes with the judges, and then the judges sampled and quietly discussed amongst themselves their impressions of the food. And, then we patiently waited until the winner was announced. Anne-Sophie Taurines, a 28-year old chef from France, who has worked at Restaurant et club Le Rouge in Verbier since 2010, and currently serves as Executive Chef and partner of this establishment. Chef Anne-Sophie is passionate about the culinary world, and she considers herself a perfectionist. For her signature dish, which would be served as a first course, she prepared marinated and hay-smoked salmon, garden vegetables, rocket/green apple/ginger sauces, condiments and flowers. This impressive and colorful plate of food was delicately arranged, with all the ingredients and sauces displayed like a work of art within a low glass bowl. After the competition, I had the chance to ask Anne-Sophie about her favorite foods in Switzerland. She mentioned fondue, of course, and said she likes all Swiss cheeses, as well as fera (a freshwater fish) and cardon. In her kitchen, she enjoys cooking with foods from all over the world and gets inspired by ingredients she discovers during her travels. 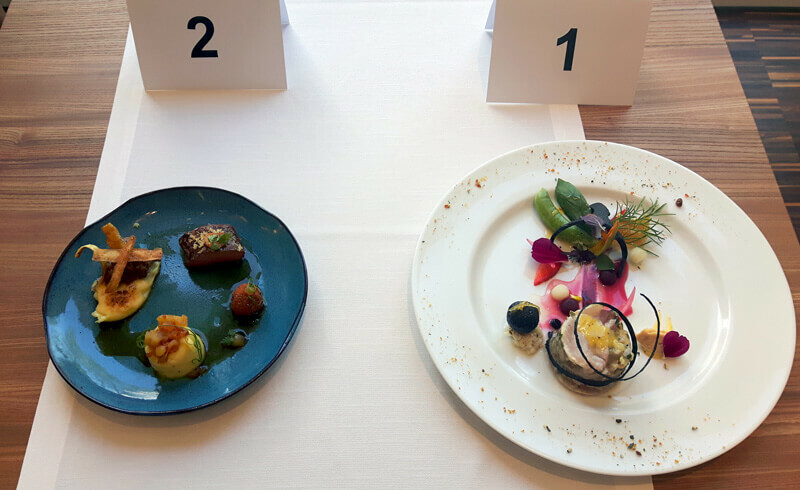 Honestly, of all the plates on display during the competition in Zürich, if I would have picked one to eat for lunch that day, it would have been Anne-Sophie’s. It looked fresh, light and delicious.